A family friendly event for the beginning to intermediate skill level Jeeper and ATV/MC riders however all skill levels will find a fun filled weekend playing on the trails and camping with friends. ATV's, Side-by-Sides(SxS), Motorcycles, Jeeps & other 4x4's, access over 200+ private acres of wooded trails, water crossings, hill climbs and other obstacles in this AMA santioned event. Jeep/Full size 4x4s/Motorcycle/ATV/UTV/SxS/ will all have special access to the motocross track located in the trails. RAFFLE sponsor donated packages, be sure to bring plenty of $1 bills for tickets. Plan on attending the driver/rider meeting Saturday morning @ 8:30AM prior to hitting the trails where they can pick up an updated trail map and where we will brief everyone on trail conditions, orient the first timers and provide any last minute trail closures or changes in safety policies and rules. Tickets not sold online will be sold at the gate until all 500 tickets are goine. Prices increase to $30/each at the gate- CASH ONLY !! If you have purchased your tickets on-line please have your printed tickets, including those for children 10 and under and for camping along with a Drivers license or State issued ID ready when you reach the check-in tables. Trails open Saturday morning at 7:30AM and close Saturday at dusk. Trails will re-open Sunday morning at 8:00AM and close at 11:00AM so event clean-up can begin. !! ABSOLUTELY NO FRIDAY WHEELING OR RIDING !! This event is open to the public and ALL clubs and groups across the USA. If you are part of a large group and wish to reserve a large camping area so all your members can be together. Simply send an email request, with the type of vehicles, total number of vehicles, approximate size of any campers and number of people camping to - lakecountyoffroad@gmail.com and we will contact you to make arrangements. in the day as you check out the raffle items and other sponsor exhibits. Featuring all your Hot Dog & Sausauge favorites including the now famous NEO JAM - MUD DOG. That's a whopping 1/4 pound chili cheese dog for only $5! Freddie will also be featuring breakfast options this year of either Biscuits, Sausage Gravy and Eggs or a Breakfast burrito and will also have your morning coffee available for purchase as well. - Sriracha aioli and onion frizzles. - Double decker tacos with chicken, chorizo, pork, or shrimp. !! Additional Ticket purchase now required !! !! Night Ride tickets will NOT be sold at the gate !! !! ONLY 50 vehicle tickets will be sold !! As a reminder during the night ride ANYONE found leaving the group, heading off into the darkness to make thier own trails or otherwise being unsafe and risking staff or other guests safety will be immediately ejected from the event and NOT JUST the Night Ride. It is not OK for our staff to have to leave other guests and risk their safety to run you down in the dark. Consider this your one warning as no additional warnings will be issued. 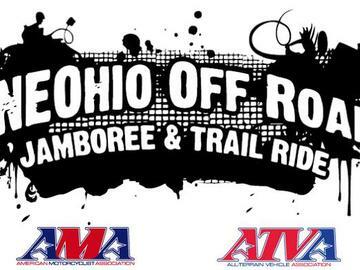 For the safety of all, anyone suspected of being intoxicated and driving on the trails or driving in the campground staff members have made special arranagements to notify the Ashtabula County Sheriff who will enforce Ohio's state law regarding OVI. RECOVERY/TOW POINTS - All FULL SIZE vehicles must be equipped with proper tow points FRONT & REAR. Depending on trail conditions vehicles without any tow points may be refused access to the trails. NOTE: A hitch is a tow point, a bumper without a recovery point is not. What if I get stuck? LCOR staff will be patrolling and will render recovery aid, however as is customary and required ALL participants must connect their own recovery lines to their own vehicles - NO EXCEPTIONS. Staff, recovery/rescue crew and other attendees are not responsible for any vehicle damage or injuries caused due to improperly connected recovery lines or failures of improperly kept or defective recovery gear. The recovery/rescue crew is a volunteer group that is only present to assist guests in getting their vehicle back onto the trail if possible. If your vehicle becomes otherwise disabled and no longer driveable it is your responsibility to arrange for a professional recovery/tow service to come to your aid. ATV drivers, Unless your vehicle was manufactured and sold as a 2 person machine this event does not permit 2-Up riding, what's 2-Up riding? That's 2 people riding on machine. The adding of a rear seat rest to an ATV does not make the machine 2 person capable. Check the manufacturers website or your ATVs left front fender for the manufacturers safety decals to guide you. permitted on the trails with out insurance and a valid drivers license. * All those under 18 must be accompanied by a parent or guardian. * Seat Belts must be worn by all drivers at all times while on the trail and in the park. track, MX track and in the park while operating an ATV or Motorcycle. * ALL RIDERS - Must follow their vehicle manufacturer's safety requirements regarding passengers. Absolutely no 2-up (ie; passengers) on any single rider machine. * Obey all signs, gates, and barriers. * Stay on marked trails. the campground or taken home with you. ** This is a family friendly event - If you can not respect the rules please don't attend. Failure to comply with ANY of the above can and will result in your immediate removal from the trails and possibly the event.